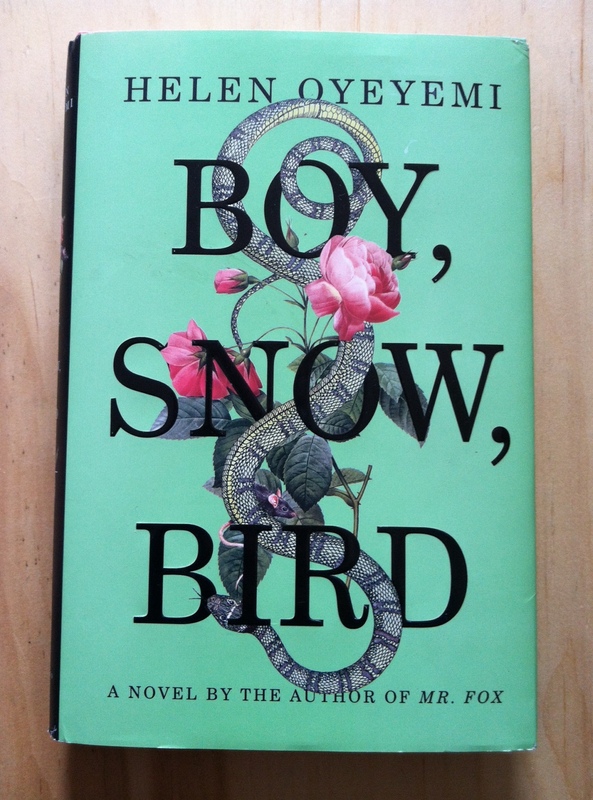 Helen Oyeyemi’s Boy, Snow, Bird* deserves all the attention it’s attracting; it’s a beautiful, lyrical novel, thrumming with life and grappling with difficult issues of love, aesthetics, race, trauma, and identity. Boy Novak flees both home (New York City) and her abusive father for life in small-town Massachusetts. Drifting from job to job, and occasionally frightened by her own strangeness (“It wasn’t that I didn’t want to speak; it just seemed smarter not to. All of a sudden it felt as if I had far too many teeth, more teeth than it was decent to show” [45. ]), Boy eventually settles down with a former professor (now jeweler) Arturo Whitman and his beautiful, enchanting daughter, Snow. However, when Boy’s daughter, Bird, is born, a secret is revealed that leads Boy to send Snow away when “Snow’s daintiness grew day by day, to menacing proportions” (142). Boy becomes a wicked stepmother in absentia. Time passes, however, and Snow and Bird prove themselves determined to reunite, to find out the whole truth (Bird is a budding journalist) — because there’s another woman missing from their story. I loved Boy, Snow, Bird. The characters’ voices are distinct, witty, and smart, and the reworking of the Snow White fairytale surprised me at nearly every turn. While it deploys the same tactic that makes C.S. Lewis’s Til We Have Faces so brutally brilliant — that is, telling an established myth from the point of view of the “evil” character — Boy, Snow, Bird is even more expertly layered. The veneer of magic both conceals and reveals our own preoccupations with perception and the practice of looking. Reviewers and readers have, justifiably, focused on the novel’s engagement with race (Ron Charles in the Washington Post has a particularly good paragraph about it, which you can read here). I’d also like to point out that the novel consistently reminds us of what it’s like to be a woman, and therefore constantly looked at (by others and by yourself). One of Boy’s teenage friends from the bookstore where Boy works, a girl named Sidonie, is catcalled every day on her way home from school (disturbingly, street harassment hasn’t changed much from the book’s 1953 setting); one of the ways that Snow is initially marked as “young for her age” is that “she hadn’t yet learned to smile even when she didn’t feel like it” (71). She hasn’t learned, in other words, the right face to show the world that’s looking at her. After the rat catcher (as Boy thinks of him) threatens to mar Boy’s beauty, to scar her badly enough that only a “true love” could accept her, Boy comes to the conclusion that “no matter what anybody else said or did my father saw something revolting in me, and sooner or later he meant to make everyone else agree with him” (123). Is it any wonder that Boy fears the face that looks back at her from the mirror, the face that sometimes isn’t hers? It’s in articulating the tension between the fear of beauty and the craving for it that Ms. Oyeyemi truly shines. *My thanks to the Riverhead Books for sending me a copy of this novel in exchange for an honest review. This book is already on my list, but it’s good to hear that you liked it so much. Your last sentence (the tension between the fear of and the craving for beauty) is what really intrigues me. It sounds brilliant. Looking forward to reading what the author has to say! It is, indeed, brilliant. And get this: This is the author’s fifth novel, and she’s not even thirty yet! Oh, I have to look her up! Have you read any of her other books? Thrumming! That’s a good word, though my spell check disagrees. I’ve heard so much about this book but your review is the first to really make me want to read it. And an interview still to come! How exciting! High praise! Thanks Laura! I think you’d really, really like the book. I’m glad you enjoyed reading it. All the more reason to read it. Thanks for sharing your thoughts about it. What first caught my eye was the title and the cover. I think it looks beautiful, and after reading the reviews, I didn’t hesitate to add it to my list. The cover is gorgeous — very well done. I have seen this book around a lot and was curious about it. I’ll put it on my TR list thanks to your review! Hurrah! I think you’ll love it.